Fresh off its qualifying transaction in late March, Boulevard Industrial REIT (BVD.UN-X) chief executive Scott Hayes sees unlimited potential ahead for his Toronto-based venture. “The business plan is to be the institutional consolidator of industrial properties in primary and secondary markets across Canada,” he said. That game plan, however, does not sound dissimilar to every other real estate outfit with a focus on industrial. Doesn’t everyone want to be a consolidator? Not at the small end, apparently. Hayes, an industrial real estate veteran (he was previously CEO and president of Dundee Industrial REIT and Pure Industrial REIT prior to that), sees a sector with an extremely diverse ownership base that makes it a buyer’s market. “There are a lot of different owners of industrial. It ranges from pension funds to lifecos to other REITs, high-net worth families, a lot of owner-occupied space, some private deals,” Hayes said. Clearly, that huge host of owners have different priorities and agendas and some are willing sellers regardless of where the market is in the cycle. The REIT’s roots date back to last July, when the venture started out as capital pool company HHT Investments, with the initials standing for the three principals. Besides Hayes, there is Mark Hogan (a director and former vice-president, business development and general counsel) and Heidi Tibben, (former vice-president of operations with Pure Industrial) who has the same role with the new REIT. While Hayes acknowledges there is competition in the industrial sector, he is banking on Boulevard being able to prosper in the sub-$10-million niche where the big guys can’t (presumably) bother to tread. Hayes expects it can do between $60 million and $100 million worth of acquisitions across Canada over the next year. Of the 1.7 billion square feet of industrial property nationally, about half is situated in the GTA, so he expects that ratio to be similar in Boulevard’s future holdings. “We do like the Maritimes, it is sort of our business strategy magnified, where there is much lower institutional competition there. Certainly, if you like Canada, you have to like Alberta. Winnipeg is a market we like and very, very selectively in the province of Quebec” with its political risk and generally older industrial stock. 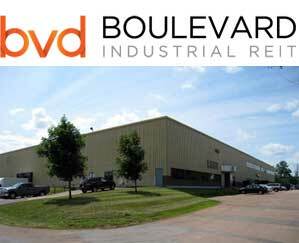 Boulevard’s $15-million qualifying transaction of three properties in New Brunswick, acquired in an off-market sale from an institutional investor, illustrates the new REIT’s acquisition strategy. The trio of properties, at 1070 St. George Blvd., 1180 St. George Blvd. and 205 Commerce Street in Moncton, comprised more than 236,000 square feet of gross leaseable area in “modern and well-maintained facilities” featuring high shipping and ceiling heights. “The vendor had recently spent a considerable amount of capital on the buildings, so that is not on our ticket, and we bought them at very, very attractive yields,” said Hayes. The deal also forced the REIT to go back to the market for more capital, which he said was not necessarily a bad thing. Hayes has been spending plenty of time in front of would-be investors and has his pitch down pat for those who may not be too familiar with the ins and outs of industrial real estate. A factor the REIT evaluates before doing a deal is market rents near the potential target. It carries out a third-party study of the rent of the prospective property as well as the surrounding area. For its qualifying transaction, it purchased the properties at a 14% discount to market rents, the REIT CEO noted. Hayes is bullish about the industrial sector and the Canadian economy in general, which should be no surprise given he expects to buy $100 million worth of properties over the next year. What is different is he has a shop-floor view of the economy rather than a boardroom perspective.